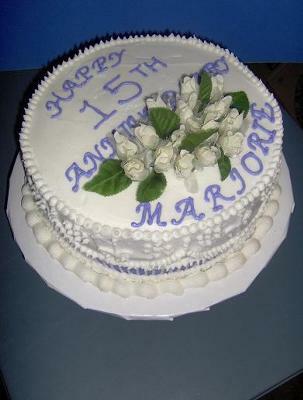 To make this Anniversary cake, I used 2 german chocolate cake mixes. Each layer was one mix. 2 layers, 12" round pans. I baked according to directions. Let cool completely. I used buttercream in white and violet and I iced between layers. I iced the sides of the cake in violet and then iced 1/2 way down with white. I used a small round tip for the decorations on the top and sides. The bottom shell border was a large star tip. I used violet to write the words. And the little roses were silk flowers. 15 of them for 15 years at her job. she's almost 77! I surprised her at work with it. This is also an experiment because I want to make my own wedding cake next year! You are going to do a wonderful job on your wedding cake. I want to do my own wedding cake one day and your cake design definetly inspires me. Superb Job!